Where do I find my total amount of podcast subscribers? Here's how to find out how many people have subscribed to your podcast. 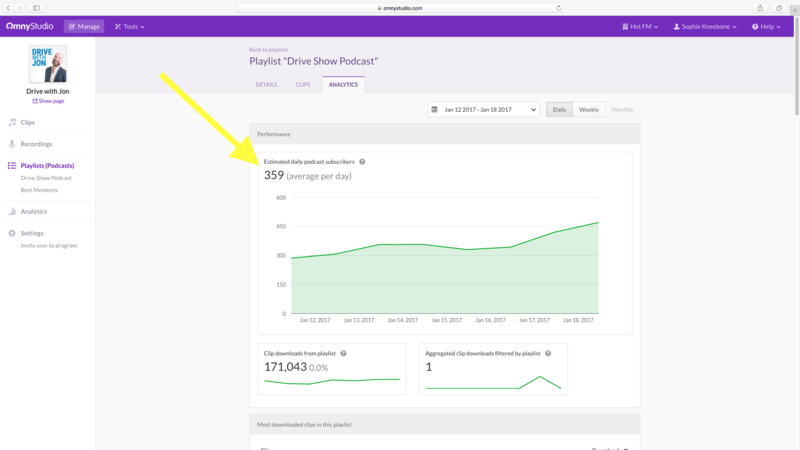 You can find an estimate of your number of podcast subscribers by going into your program or playlist analytics clicking on the Analytics tab. Your subscribers will be shown at the top of the screen. The way subscriber numbers are counted, it's currently not possible to get an exact total number. Basically it's added up by counting the amount of unique IP addresses that access the RSS feed in a selected time period and assuming they're all a separate person (or subscriber). The reason we can't get an exact number is that listener IP addresses can change (for example, if a listener is using their computer and their phone to listen to a podcast, that's 2 different IP addresses) and so you get some double ups. Our testing has found that the most accurate way to track the "current" amount of subscribers is to keep track of a rolling average number, which is why it's described as the "daily estimate". The daily estimate number is therefore the most accurate number of subscribers. We recommend viewing it within a 7-day range to get a good overall measure of how many people have subscribed to your podcast.